Our customer service shines through in faith-based projects. Our design services team is able to effectively mix functionality and cost controls, all while finding an end solution that provides the warm, pleasing setting you desire. Between our sizeable workforce and cross-trained staff, meeting the often-requested, Sunday-to-Sunday work schedule is not an issue. First opened in 1881, the Mother church of the Diocese of Green Bay, St. Francis Xavier Cathedral, was in need of interior renovation. The spiritual facility was closed for three months, September through November of 2017, to expedite the restoration process. HJ Martin worked on glass doors, and flooring elements of Resurrection Church including installation of carpet tile, ceramic tile, VCT, Kawneer entrances and windows, hollow metal frames, doors, wood doors and push/pull hardward. Set up as a phased project, HJ Martin crews maintained a tight schedule in order to get work completed between services without interrupting church activities. Excellent customer service, open communication with the church council and acute attention to detail were crucial to the success of this project. HJ Martin installed 420 square yards of Tandus Stratify Carpet in the balcony and nave aisle-ways. One crew was used for this remodel, which was completed in four days. Carpet was intricately worked to fit around the pews in a clean and consistent manner. In renovating the church as well as the education building, HJ Martin completed a unique installation of Flotex sheet flooring in the gymnasium, Mannington Essentials and Mohawk Carpet. Like many other projects with religious organizations, time frame was a core consideration. Due to the fact that All Saints Church was in operation during construction, HJ Martin crews paid careful attention to keeping dust and noise to a minimum. HJ Martin installed 467 square yards of Mannington carpet, 122 square yards of carpet tile and 4,000 square feet of Centiva-Contour vinyl tile. Vinyl Tile was installed beneath the pews, carpet tile was installed on the alter and carpet was installed in the church's hallways. This remodel was completed in ten days with one crew. Existing carpet was removed and modular carpet was installed in the worship area, gathering area, coatroom, baby room, sound room, hall, office, entryway, classroom and storage rooms. Luxury vinyl plank and underlayment were installed in the alter area. HJ Martin installed carpet tile, sheet vinyl, ceramic, and hardwood flooring throughout Fox Valley Unitarian Church. Unique layout of the altar required carpet and hardwood installation on curved steps. 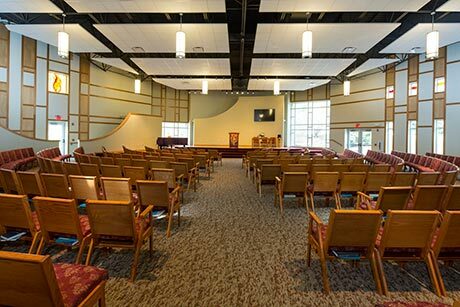 Budget considerations and material aesthetics played a big role in how HJ Martin was able to help Fox Valley Unitarian Church choose materials and complete the project to its requirement and satisfaction. Engineered hardwood and carpet were installed on the church's alter. 315 square feet of engineered hardwood and 120 square yards of carpet was installed in four days with one crew. The alter work consisted of many complex angles and steps and was executed with precision.